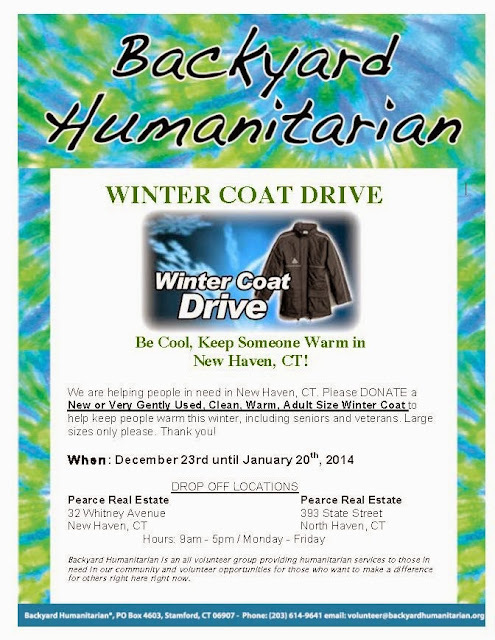 What's Up New Haven: Backyard Humanitarians of New Haven Coat Drive - Happening Now! Backyard Humanitarians of New Haven Coat Drive - Happening Now! I would like to thank Welcome to New Haven for providing the heads up on this wonderful giving opportunity. In the wake of these bone-chilling days, here is something you can do to help others and all it takes is a little spring...errr...winter cleaning! The Backyard Humanitarians (New Haven Chapter) is asking for new or gently used adult-sized jackets for their Coat Drive. Details may be found on the flyer above for drop-off locations and donation hours. Your old coats would be tremendously appreciated as some New Haven folks are (sadly) braving the single-digit temperatures without a coat on their backs! The Backyard Humanitarians is an all-volunteer group that dedicates its efforts to minimizing problems within our community. If you would like to get involved, you may e-mail volunteer@backyardhumanitarian.org for more info. Additionally, keep up with the Backyard Humanitarians on their Facebook page and/or request to join their Facebook group!